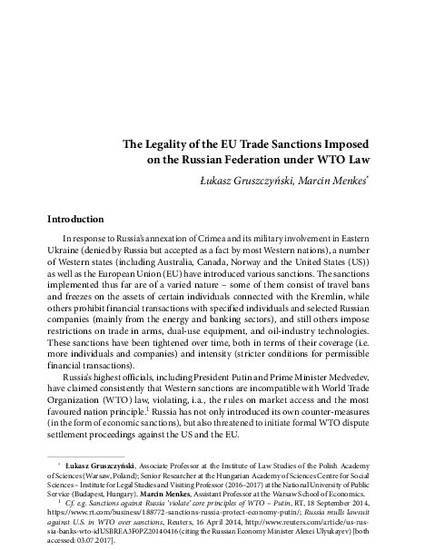 The aim of the chapter is to assess the legality of the European Union (EU) sanctions on Russia under WTO law. In this context, the authors claim that some of the sanctions either fall outside the scope of WTO law or are related to aspects which are not covered by specific commitments made by the EU. Consequently, they cannot be deemed to constitute a breach of the General Agreement on Trade in Services. Those measures which, nevertheless, fall within the scope of WTO law (e.g. bans on sale of dual-use equipment and oil industry technologies) and which may be regarded as incompatible with certain obligations (e.g. prohibition of quantitative restrictions introduced by Art. XI of the General Agreement on Tariffs and Trade), can be still justified under the so-called security exceptions included in respective WTO agreements.